Employers are committed to creating standard resignation process flowcharts to help everyone in the company understand the process. 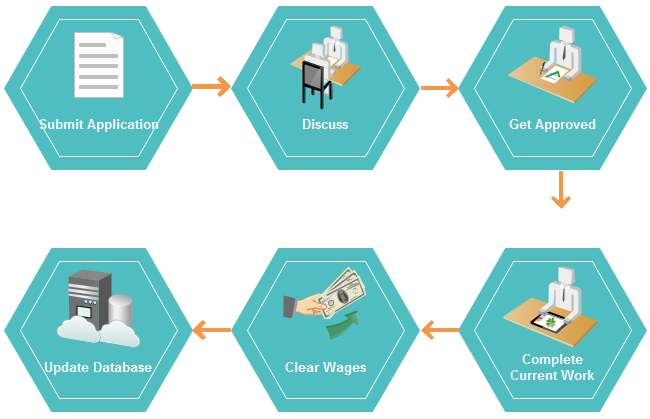 Read about this introduction on how to make resignation flowchart. A perfect resignation procedure is quite significant for both employers and employees. As for the former, the staff are very important for company's long-term development and profit earning. So it's crucial for employers to retain talented workers and maintain image in exit procedure. A good resignation process not only ensures that relevant things on resignation are dealt with effectively but also can help to receive much useful feedback from resigning employees. 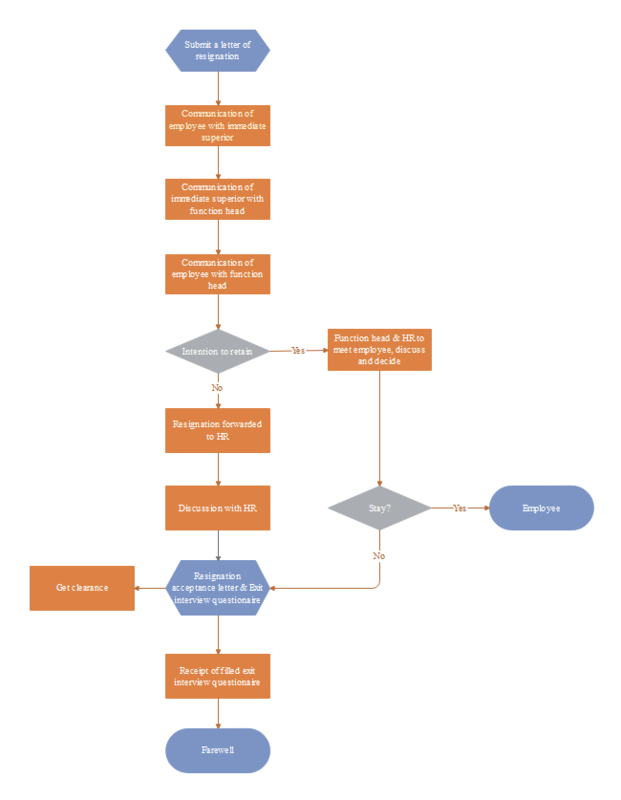 Therefore employers are committed to creating a standard resignation process flowchart. This article is aimed to illustrate resignation process and show how to create an effective resignation process flowchart. Briefly, the resignation procedure can be concluded as four steps. At the first step, employees inform their superiors of the intention to resign and submit a resignation letterr via email or handwriting. Other forms of resignation cannot be accepted. Letter of resignation should be addressed to HR department one month in advance. That is to say, employees must continue to work for one month after submitting the resignation unless they get a special approval from their superiors. Period of notice is stipulated in the employee's contract, varying depending on employee position, grade and length of service. The second step is to discuss and decide whether to retain the employee or not by superiors and function managers. If they want to keep that employee, function head and HR will arrange a conversion to persuade him/her to stay. Otherwise the procedure comes to the next stage. If workers agree to stay, the resignation procedure ends here. If not, it will come to the third step. During this step, resignation will be accepted and employees will get clearance on payroll and job duties. Meanwhile, workers are required to complete an exit interview questionnaire. How to Draw Resignation Process Flowchart? Step1. Get a complete understanding of resignation process. You should be quite clear about the procedure of resignation basing on rules of your company and Law of Labor. It's better to draw this workflow on papers first and then alter it to the best. Step2. Select a professional flowchart tool. Can export to other common file formats. 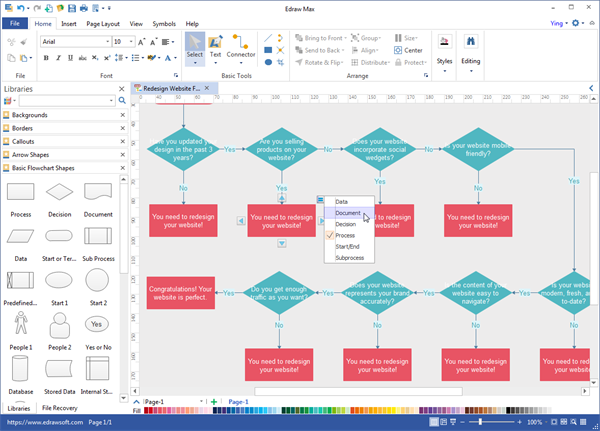 Edraw flowchart maker is one of the best flowcharting programs with many practical features that greatly save your time. It enables users from all levels to make professional looking flowcharts. Download it now and enjoy its abundant built-in flowchart symbols and automatic functions. 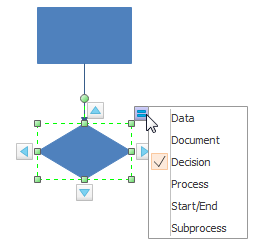 You may also want to read Create Flowchart for Document Management, and Use Flowchart to Manage Projects.